9 August - This afternoon we returned from Cornwall and I will not be trying to catch up with my diary properly until at least tomorrow. Back to the holiday - We had a nice time (as usual), although it included what was probably the wettest period we have experienced down there. We left a very dry Aldershot and travelled down in sunshine. In fact, it was the day of the Culdrose (down on the Lizard) Royal Navy Station's Air Day and they had the best display weather for many years. However, in the days that followed, the skies turned dark grey and stayed that way for over a week. In a way, that wet weather was good in that it forced me to rest, and during the time spent waiting for sunshine to return we read a newspaper article about new research that may hold some hope of a treatment for CFS - my fingers are crossed. In all fairness to Cornwall, the wet weather affected much of the country, including Aldershot. The second part of the holiday saw the weather improve, and the last few days it was close to perfect. Yesterday we spent some time down at Lizard Point watching yachts taking part in the Fastnet Race as they sailed west. There was so little wind that the sea was flat, and some of the boats hardly moved all the time we watched - it could be a long race! Having said that, the leaders were already approaching the Fastnet Rock, off southern Ireland. As usual, the garden has turned into a jungle in our absence, so the next few days will be taken up with sorting it out. Sheila has spotted a House Martin going in and out of one of the boxes, so although the chicks must have fledged by now we may still have action to report on this month. 15 August - A warm, sunny day. Since our return the weather has been cool with some showers, but today we have got back to decent summer's weather. I have been struggling to get back into action since we came home. I've sorted out parts of the garden but until yesterday had done very little with my camera - the holiday pictures are still awaiting my attention. I can now confirm that there is a pair of Martins using the right-hand nestbox. We had seen a bit of activity in the early mornings, but today there has been action at the entrance during the day (this picture being taken around 5pm). The signs are certainly very good that we have a late brood as happened last year - great news! In the garden, bird activity is very limited. We're seeing just a few Sparrows, a couple of Collared Doves, a Robin and the occasional Goldfinch. I've heard a Blackbird but not seen one. There is a family group of Magpies about, but they haven't come near the garden. The Stinging Nettles are at last providing food for a caterpillar. 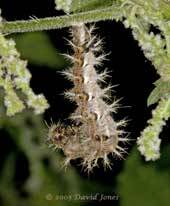 There is a solitary Comma Butterfly caterpillar munching away at the leaves of one nettle plant. I've looked for signs of another one, but without success so far. 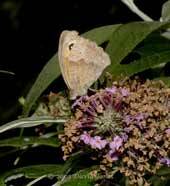 The only adults butterflies seen in the garden this last week have been Large Whites. I've been too tired to go out after dark to get moth pictures but this Old Lady moth came into the house while we were watching TV and I had to help it back outside. In flight it has a wing span of around 8cm. This afternoon I spent a while watching the solitary bees at the new bee hotel, and noted a couple of interesting bit of behaviour. First of all, compare the materials being used by these two bees as they finish off sealing the entrances to the 3mm holes. While the lower bee has added sand grains to the resin, the upper bee chose to use wood chippings left over from when I drilled the holes. 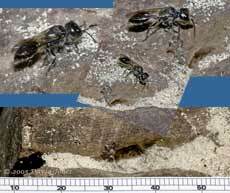 It obtained these from the larger 4mm holes further down the branch (and which have not been used by any bees so far). 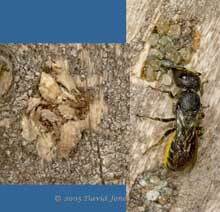 This pair of images shows a close-up of the lower bee, and another hole that has been sealed and decorated with large woodchips. 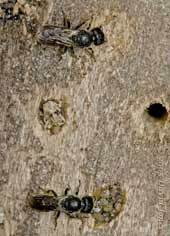 While the bees are usually solitary, and tend to 'see off' others that approach too closely, that rule seemed to be broken further up the branch as these three bees were taking an interest in the same hole. I think the top bee was the 'real' owner, although the bottom left individual also seemed to be attending to it. It seemed as though the right-hand bee was more interested in stealing some of the 'resin' being used to seal the hole. 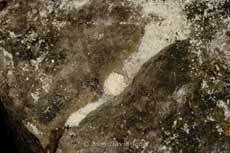 Here, while the owner carried on working on the hole, the 'thief' was pulling the piece it has prised off to break the thin strands that still attached it. Having succeeded, it flew off with it to another hole. 16 August - A pleasant, very warm summer's day. We continue to see occasional comings and goings from the Martin nest. At one time both adults spent several minutes together in the nest. We actually had a female Blackbird down feeding under the Hawthorn for the first time since our holiday. Yesterday afternoon I noticed a small pile of 'sawdust' next to a hole in the top of a rotting log under the Ivy tree. In the evening the hole had been filled in with the bits. When I looked again this morning the hole had been cleared out. The bottom image shows how the sawdust has filled in a crack in the wood. The hole is in the middle of that image. 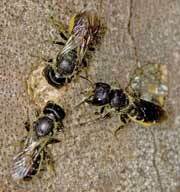 A long wait in the middle of the day was rewarded with several sightings of the solitary wasp responsible. It measures about 12mm in length. Just before our last holiday we bought a small LCD TV for use in the caravan. 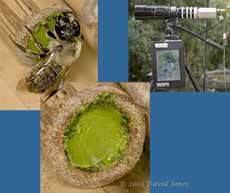 It can also be used as a cctv monitor and this afternoon I tried this combination for the first time to follow progress as a leaf-cutter bee started work in one of the bamboo tubes by the veranda. It spent several hours cleaning out the old leaves and other bits left over from last year's activities. Once it had finished this job we were fascinated to see it spend time apparently licking the sides of the tube with its tongue, something I have not seen previously. By the late afternoon she was bringing the first pieces of leaf. We saw three bits go in, but one was brought back out and discarded. In the early evening she started returning with the underside of her abdomen coated in a thick, bright yellow layer of pollen. Tomorrow I may spend some time trying to get some photographs of leaf-cutter activities. 17 August - Summer continues (again) with another warm warm, sunny day. 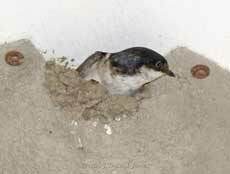 House Martin activity continues as we wait to see if/when they start to bring food. At the bottom of the garden the solitary wasp continues to work on its burrow. When I checked the log at around 10pm last night, the hole was still open. However, the picture shows it at 7.30am this morning, and as you can see it has been covered over with the 'sawdust'. Within an hour it was open again. The log is in the middle of the Stinging nettles and each time I check the log I also have a look at the Comma caterpillar. Today this shows all the signs of starting to pupate. Since first thing this morning it has been hanging head-first from a leaf stalk. The rear end of its body became thinner and the front end remained in this curled posture until at least 1pm. When I checked it again at 4pm I was amazed at what I saw. 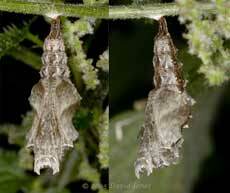 During the previous couple of hours it had gone most of the way though its transformation into a chrysalis. The Large White butterflies continue to visit, but today we have had a bit of a change in the form of this Meadow Brown (female - I think) butterfly, visiting the few remaining flowers on our Buddleia plant. 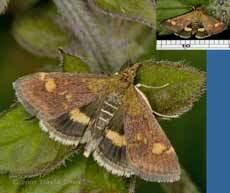 A afternoon visitor to the water mint plants was this very pretty micro-moth, Pyrausta aurata. I haven't mentioned the Orange Ladybirds since our return. 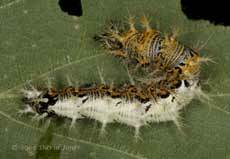 This is because I'm not seeing any adults at the moment, and I have found just two larvae over the last week. I'm keeping my fingers crossed that more appear soon. While searching the Birch for these ladybirds this morning I did come across something 'new' on the tree. 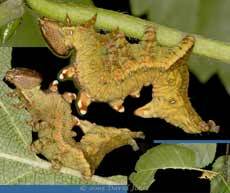 At first I though it was a bit of dead leaf, until I looked closely - it is the oddly shaped caterpillar of an Iron Prominent moth (Notodonta dromedarius), a species that is widespread in Woodland and wooded countryside. It looks as though this is a second brood, and it will head underground in the Autumn to pupate, not emerging until next May. It wasn't possible to measure it extended, but in the top image it is about 18mm front to back. 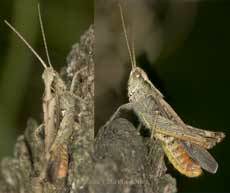 Like the Orange Ladybirds, the Bush Crickets seem to have vanished, but today I spotted two grasshoppers. The first actually flew past me to land at the top of the log in the big pond. I couldn't get very close to it, but I estimate that it was just under 20mm in length. Just after I took these pictures it flew off to the other side of the pond. 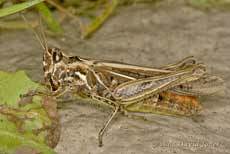 This second grasshopper preferred to remain on the ground, only jumping/flying a short distance when startled. Here it is chewing at a plant on the garden path. A larger individual, It measured some 25mm in length. If you click on the image to see a larger version, you can also see some other images of it from different angle. Despite the very bold markings on the second example, I suspect that they may be of the same species, possibly the Common Field Grasshopper (Chorthippus brunneus)? 18 August - An even warmer, dry, but humid day. I decided to do some pond clearing today. It's a slow job because I need to check everything I remove but I didn't get far before I had to stop for a rest, so the job was left far less than hlf-finished.. Amongst the beasts rescued were numerous newtlets, a couple of large frog tadpoles (with no signs of metamorphosis having started), some Water Scorpions and numerous snails and bivalves. Perhaps I will get to take some photographs over the next few days. 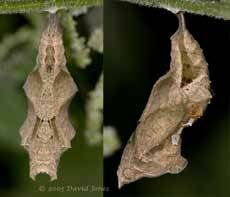 The Comma chrysalis now resembles a curled up dead leaf as it hangs from the nettle stalk. I shall need to take care during the Autumn/Winter to avoid removing or trimming that plant. 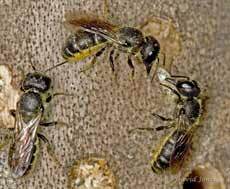 Being weary is a good excuse for sitting down to watch the leaf-cutter bees at work. Around lunchtime, Sheila and I spent ages watching this bee finishing off the job it started two days ago. It started closing off the tube more than its body length into it, bringing numerous sections of leaf to build up a thick 'front door'. Everything went well until it got to the last couple of millimetres when it seemed to have trouble gluing them. The top right image shows the cctv camera arrangement we used. The 300mm Pentax lens gave a field of view of just over 2cm across. Just one moth picture today. This one flew into our kitchen in the late afternoon. It measured about 35mm across. 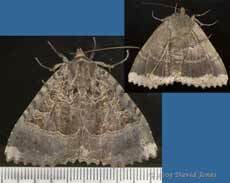 This is one I shall have to identify tomorrow - see below.